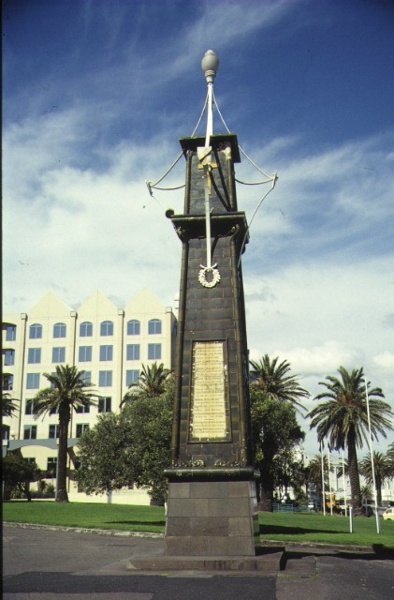 The South African War Memorial to honour the St Kilda soldiers who fought and died in the Boer War was erected in Alfred Square in 1905 after funds had been raised by public subscription. It was designed by Arthur Peck, although it is probable that Robert Haddon, who did work for other architects including Peck, was largely responsible for the design. The design combines a general classicism with Art Nouveau style ornamentation. CD Richardson was commissioned to make a life-size figure of a soldier for the panel. The tiles were constructed by the Australian Tessellated Tile Company. The drinking fountain components, originally part of the structure, have been removed. The memorial is a tall, tapering shaft, faced in olive green faience work, on a granite-clad plinth. It is divided horizontally by three bands of faience mouldings. Wrought iron strap work, painted white and enriched with metal shields, supports an electric lamp. The corners of the shaft are articulated by bold, cylindrical, pipe-like forms terminating in elaborate tendrils, volutes and vegetal forms at each of the horizontal mouldings, representing the trunks, foliage, nuts and roots of gum trees. The South African War Memorial is of historical and aesthetic significance to the state of Victoria. The South African War Memorial is aesthetically important for its distinctive composition and the fine craftsmanship of the faience work. The Art Nouveau faience work and the wrought iron work are characteristic of the work of the noted Melbourne architect Robert Haddon and it is probable that he was involved in the design. Haddon's distinctive brand of Art Nouveau style was a seminal influence in the development of modern Australian architecture. The South African War Memorial is of considerable historical and social significance as one of the most prominent and distinctive memorials associated with the Boer War in Victoria. Its scale and position imbue the memorial with a strong, symbolic presence. The Boer War was a pivotal moment in Australia's history. It was the first time that volunteers from Australia and New Zealand had fought together in an overseas war and the first time these troops paraded together in Melbourne and Sydney, presaging the ANZAC tradition. The war was at a time of growing national consciousness for Australia. The memorial is a poignant symbol of the war and conveys the deep sentiments of the Victorian community towards this important event in Australian history. The incorporation of eucalypt motifs into the faience work and the green and gold colour scheme reflects the rising nationalism of the time. 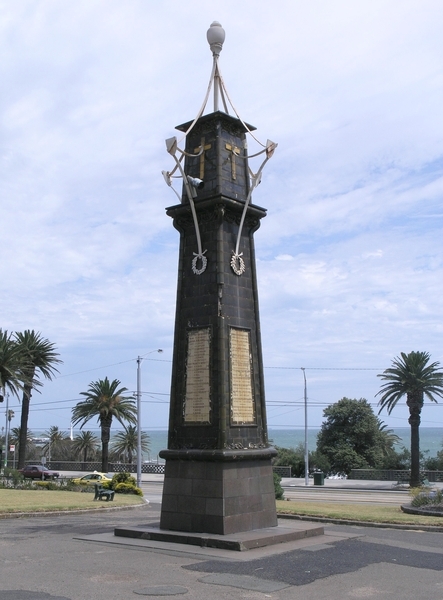 South African War Memorial, Alfred Reserve, The Esplanade, St Kilda, Port Phillip City Council. 1. 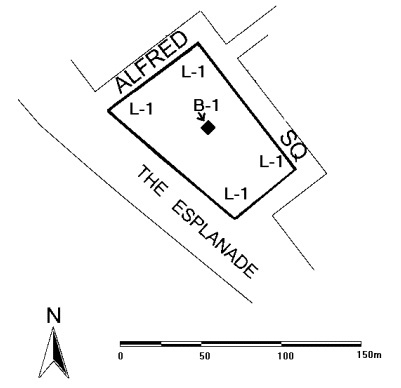 All of the structure known as the South African War Memorial as marked B-1 on Diagram 607729 held by the Executive Director. 2. All of the land marked L-1 on Diagram 607729 held by the Executive Director.